Remember when the spy flick Stratton was a project being shepherded by Superman himself, Henry Cavill, as potentially his next franchise vehicle? Well that was a while ago now, and instead the role went to another comic book actor, Dominic Cooper, who splits his time between AMC's Preacher and as young Howard Stark in the Marvel Universe. Judging by the newly-released trailer, Cooper is more than capable of carrying the action burden. The film is based on the popular eight-book series by Duncan Falconer that follows SBS operative and MI6 agent John Stratton who must track down and stop a dangerous terrorist cell. Yeah, that's pretty basic, but the footage suggests a lean, slick thriller from director Simon West (The Mechanic), who clearly has been studying up on James Bond. 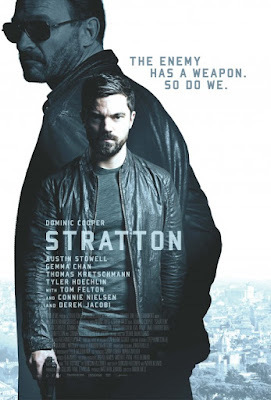 Also starring Derek Jacobi, Tom Felton, Tyler Hoechlin, Austin Stowell, Connie Nielsen, Gemma Chan, Thomas Kretschmann, and Jake Fairbrother, Stratton opens overseas soon but has yet to find a U.S. distributor. That should change soon, I would think.